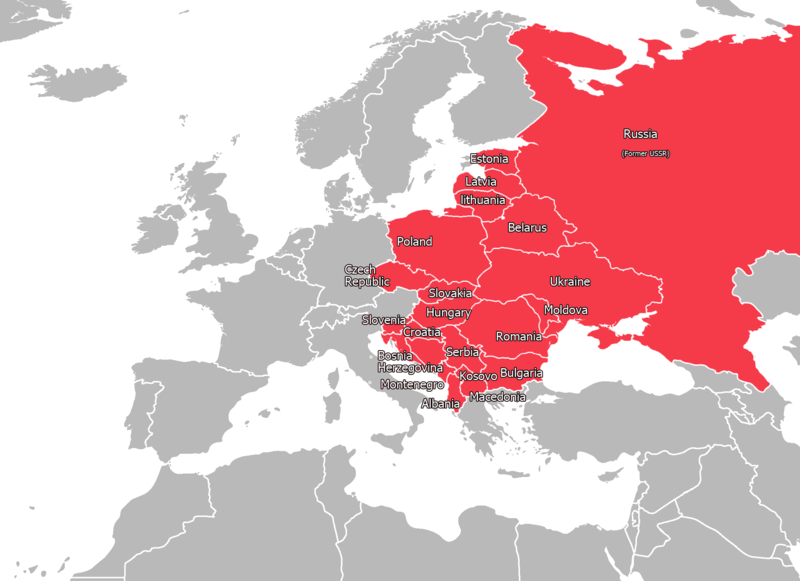 The countries in Red above make up what is known as Eastern Europe. East Europe as a concept has been in decline since the end of the cold war. Many of the countries on the Western border of the above countries marked in red have either entered the European Union or are moving to join. Joining the European Union is conceptual a step to becoming a Western country. Countries like Slovenia, Poland, Bulgaria and even the Czech Republic. Look at this map for a more complete idea of the countries that make up Western Europe and a list of the countries trying to enter the European Union. Yugoslavia – which split into Croatia, Slovenia, Bosnia Herzegovina, Montenegro, Serbia and Kosovo. Czechoslovakia – Which split into the Czech Republic and Slovakia. So as you can see even though we still use the terms Western and Eastern Europe, they are quickly becoming an outdated concept and the boundary that separates East and West is blurrier than ever. here we have a list of the countries that make up Eastern Europe.